1. Combine all of the ingredients in a jug and stir well. Taste and adjust the balance of spicy, savoury and sour with Tabasco, salt and lemon, as you like. 2. Serve in highballs filled to the brim with ice, and add a celery stick and a good grinding of black pepper to garnish. 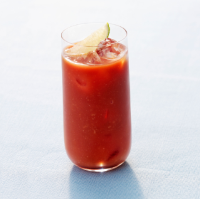 To make it a Bloody Mary, also add 50ml sherry and 100ml red wine. Recipe taken from Chilli Notes by Thomasina Miers, Hodder & Stoughton, £25. Click here to see Thomasina Miers' Everyday hot sauce recipe.